The Norwegian Cruise Line Jewel was recently picked as the ‘highest rated Norwegian ship’ by cruisecritic.com and it is not hard to see why. With varied destinations such as the Bahamas, Florida, the Caribbean, the Pacific Coast, Panama Canal and added this year, Alaska, the Jewel is a shining example of what cruising should be. From a Bahamas cruise from New York to an Alaska cruise from Seattle, the Jewel offers passengers the absolute best in dining opportunities, with such varied fare as the always open Blue Lagoon, Cagney’s Steakhouse, Chin Chin Asian Cuisine, the French Le Bistro, Mama’s Kitchen for Italian favorites and the Sushi and Saki bar, not to mention the two main dining rooms Azura and the Tsar’s Place. Its 13 nightclubs and bars include FYZZ cabaret bar, Magnum’s Champagne Bar and Shakers Martini Bar. The Norwegian Cruise Line Jewel offers myriad accommodation options from the regular cabins found on other ships, right up to the Haven class of rooms that also include access to Haven decks and amenities. With its 3 sets of elevators, your room is never too far from easy access to the other decks, the art gallery, Stardust Theatre, chapel or fitness center. Norwegian cruise ships offer patrons the best in entertainment at sea, as evidenced on the Jewel with her shows including Band on the Run, featuring the 70’s music and artistry that made the decade stand out, the Cirque Bijou or the various comedy and magic shows to tickle the funny bone. The kids aren’t left out of the fun, with the Nickelodeon character breakfast and slime show, the many pools, Splashdown kids club and the Sapphire kid’s pool. Norwegian Cruise Line Jewel offers something for everyone, even if that something is simply sitting by the pool with a cold drink. It is your cruise, and Norwegian offers you the flexibility and freedom to do it your way. Whether you are on the Jewel for New Orleans cruises that stop in such places like Mexico and Belize, or you are in the market for a cheap Alaska cruise that shows the majesty of the state, she will not disappoint, taking you and your fellow passengers on an amazing adventure as she cruises the high seas. 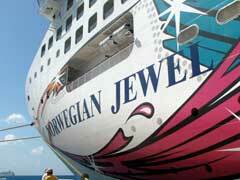 As far as stunning ships go, the Norwegian Cruise Line Jewel is a ship definitely worthy of her name.